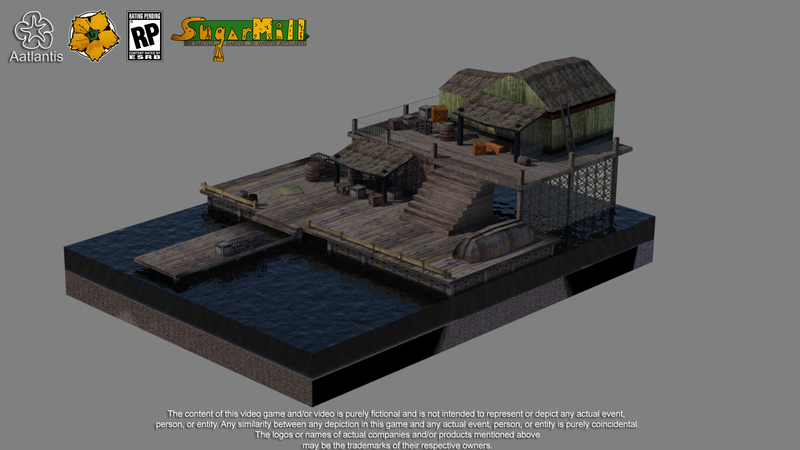 Help SugarMill get Greenlit! Vote now! Vote now ! 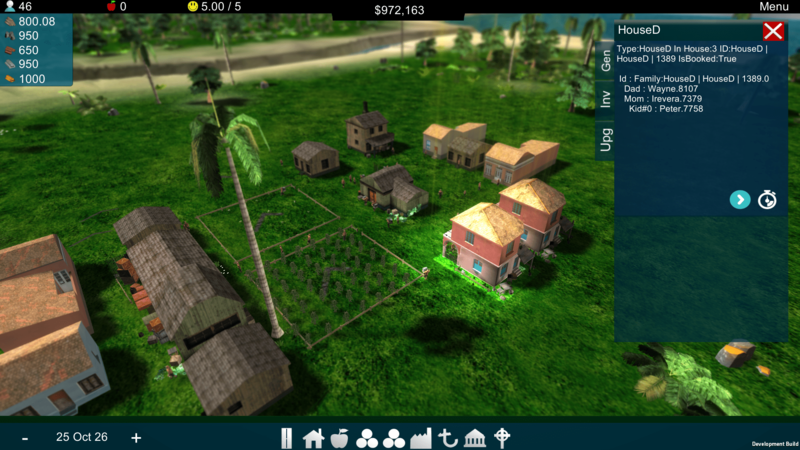 Help SugarMill on Steam Greenlight ! 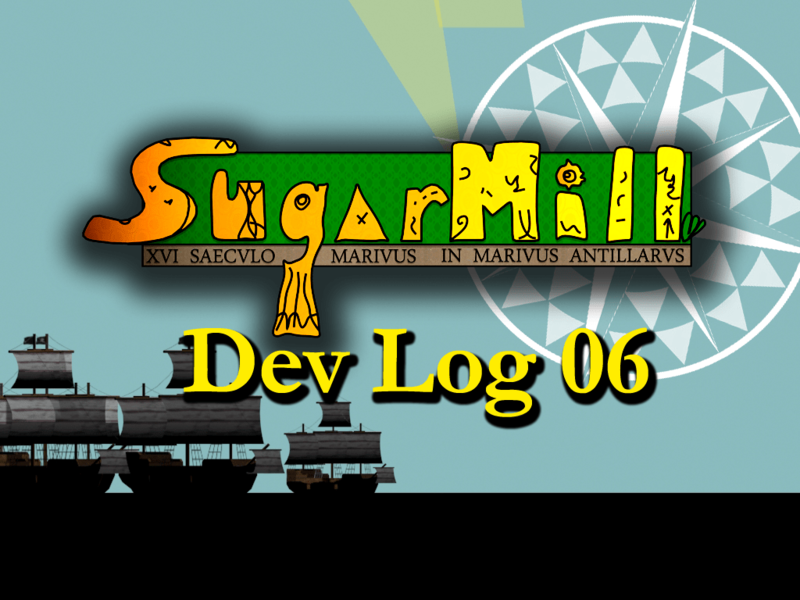 Sugarmill – City builder – Dev Log 6: What is unique about SugarMill? 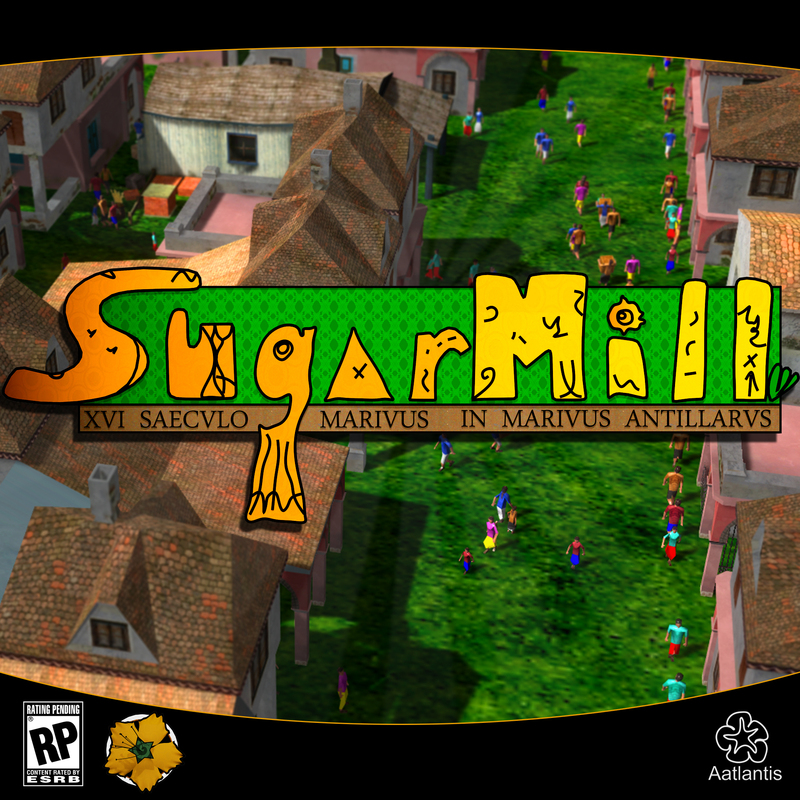 First thing I would like to announce SugarMill is now on Greenlight so you can cast your vote! What is unique about SugarMill? All measurements in the game are as real as possible. All KG or Lbs occupies a volume. A 100Kg of gold will occupy less volume that a 100KG of wood as the gold is more dense than wood. Formula: Volume = Mass / Density. All buildings that have and use storage will measure how full they are as the volume in the storages fills up. In 1cubic meter you can fit 1000Kg of gunpowder but only 100Kg of wood. There are 3 different types of houses in SugarMill, bohios(shacks), wooden houses and brick houses. The houses will affect the happiness and the amount of kids a couple will have. In a bohio a couple will always be unhappy and will have a small chance of having a maximum of 1-2 kids as this places are really damp and cold at night. In the Caribbean latitude, it rains a lot and at night time gets very cold. 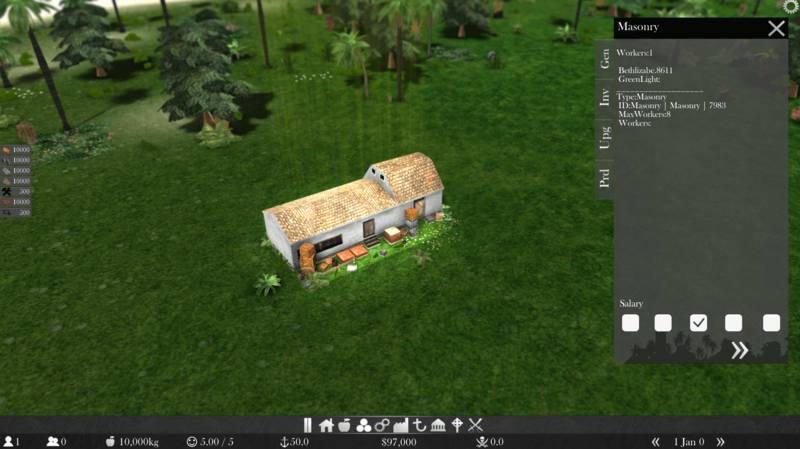 Bohios will be easy to build, you roughly will need 100Kg of palm leaf and 200Kg of wood to build it, on the other hand building a brick house will be much more difficult, roughly you will need 5000Kg of brick, 500Kg of wood, clay, roof tiles, and some stone. However, on a brick house families will be happy, and will have a good chance on having a maximum of 1-3 kids. A unit in game will be real. Unit used to each product is weight. For example if you want to build a fort to decrease the ‘Pirate Threat’ you will need a roughly 20,000Kg of Stone. Also in game you could change from Metric to Imperial units. It was hard to be away in the Caribbean and have a thriving village at the same time those days. 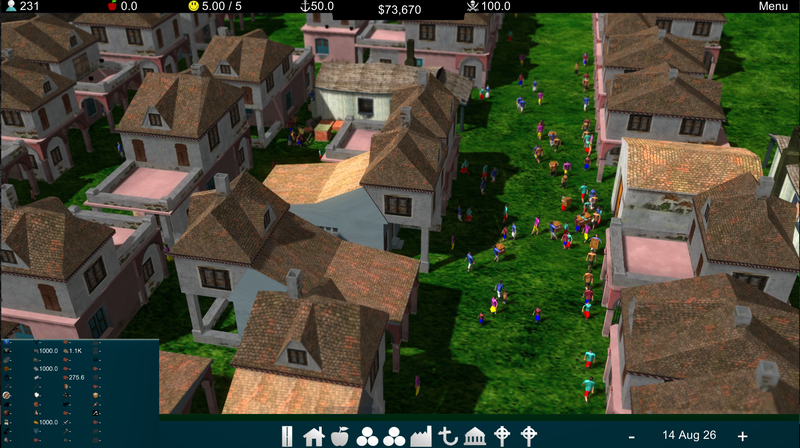 Therefore as you village gains name with the ‘Port Reputation’ and as your gold, silver and diamond reserves increase the pirates will pay closer attention to your town. If the ‘Pirate Threat’ indicator goes over a certain score depending on game difficulty you will die and therefore lose the game. As your settlement is fairly new and no one knows about it, you get little to no attention from the ships and convoys that pass around you. With a Port Reputation of zero roughly your port will get a new ship every 10 years. Increasing the port reputation is going to be one of the challenges of the game as you keep your people happy and economy stable. You can increase the port reputation in many ways: Emigrants, Lighthouses, Book Routes, Maps, Dock, Supplier and in the Shipyard. People whom are not happy in your town for a certain amount of time will emigrate from your town. The bad thing, they won’t work in your town anymore, they won’t have kids and so on. But the one good thing about it is each year they live overseas, they will increase just a bit the ‘Port Reputation’ as long they are alive they will always do so. There are 3 buildings that interact with ships. As ships pass by your port they may need supplies for their trip, regardless if they are going into deeper into America or going back to Europe. They will always will need things like, fresh fruits, meats, water, and always needed Caribbean rum. As ships dock in at these buildings they will give good feedback or bad as a consequence of what they traded at this building. Piracy was really big those days, hurricanes, tropical storms and strong winds could happen at any time. Hence it is logical to stop by and get parts of their ships repaired, replacing a mastil or repairing it. Getting new sails, strings and even ammunitions, gunpowder, cannon parts, weapons and many others. As the village governor you must manage to produce or import these goods so ships are able to get a decent repair done in your shipyard. Here you will be able to import and export any good. Ships that are coming by could be able to take or not your whole orders, smaller ships will have smaller storage rooms and bigger ships might take it all. All trading in the game will be paid in the crown currency. Silver, and gold coins. You will need have a positive balance to keep the game going. As you need to pay your workers. If the money balance of the game goes below zero over certain amount of time you will lose the game. You can make money exporting goods that you produce or you might find trade loops, where you can import some goods and resell them. In the ‘Supplier’ and ‘Shipyard’ you will get paid for all goods and workmanship taken by the ships. Furthermore you can build a ‘Coinstamp’ building. I won’t recommend importing silver and gold, as it is expensive and calls the attention the Pirates attention to your town. However if you have enough mines and have already some gold and silver in storage you could make coins, the game currency which will be added directly to your account. A ‘Coinstamp’ building will increase the pirates attention to your town. 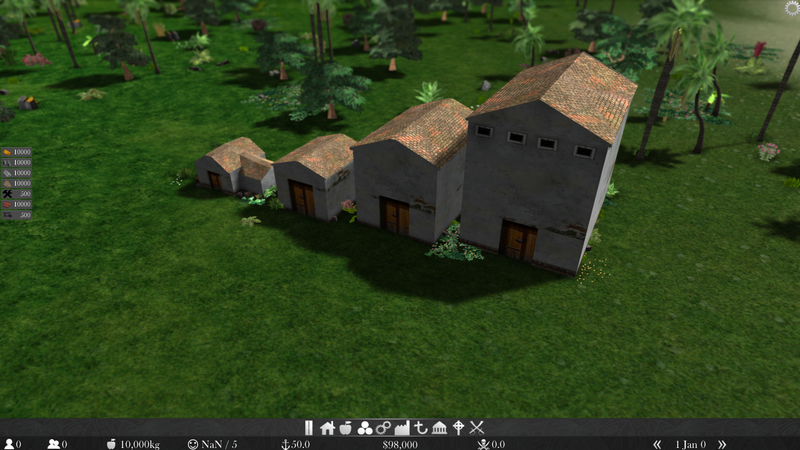 You can build military buildings to diminish the ‘Pirates Threat’. Post Guard, Fort and Morro. They all have the same functionality in some way. However, if you can build a Morro you will most likely banish the Pirate Threat. In the process you could lose the game as ‘Pirates Threat’ increase dramatically when you start the building of one. Building a Morro takes a long time and a lot of resources as well. You need to have a really strong economy and military support to do so. At the moment there is more than 40 different products in the game. Each one has its own specifications: density, price, productivity and pirate attention factor. As the amount of silver or diamonds in your storages increases this will dramatically increase the ‘Pirate Threat’. There is over 20 different product classified as food. Each ones have its own nutrition value. Each person has their own schedule, home, work, church, etc. They will work and produce depending on their age, years of school and happiness at work time. Each person will have a different speed in the game, a small variance that makes the game more realistic. This will change eventually and randomly. People that are well fed tend to walk faster. People will wait until majority of age to move out of their home, if they can’t that will add unhappiness. GUI design is minimalistic and still a work in progress. On the left side of the screen it displays the resources you have in storage obviously at the volume higher than zero. If it does not show then you do not have any # of units for that type of product. Wheel Barrowers will need wheelbarrows to allow them carry the products. If wheel barrowers don’t have the wheelbarrows then they will carry 3 times less. You can produce wheelbarrows at the Carpentry. 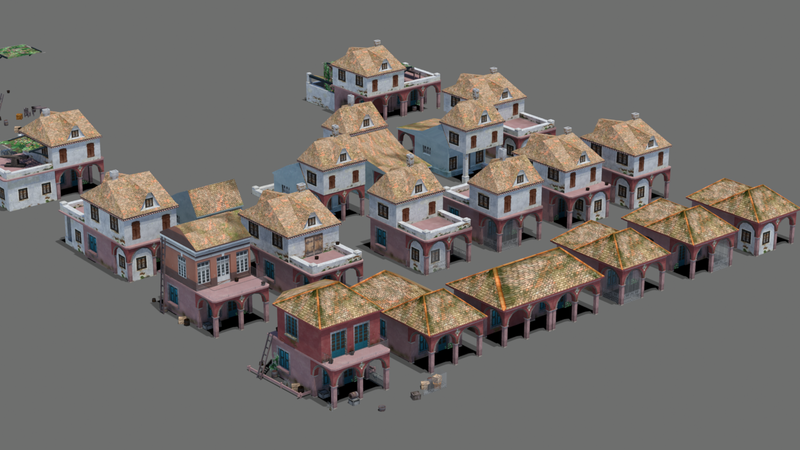 Each house will be slightly different as there are many models and each can have different combinations of materials, the decorations around each building are completely random and unique. I would like to conclude by saying that mainly all the things that are in game now will stay for the final release, some may be removed and other things may be added as the development process sometimes is a bit hard and unpredictable. The challenge I’m facing now is mainly with the performance of the game. I have to change drastically many things regarding that. I have only 7 weeks to do so and many other things LOL. Want to give my infinite thanks to the GameDev Show and Test Facebook group (https://www.facebook.com/groups/1062299557132732/1210893115606708/?notif_t=like) as they helped me so much in the polishing of the game to get ready for Greenlight. The most important thing: The game is now available for vote on Greenlight .You can support and help the game by voting and spreading the word. My last dev log was only a week ago. A lot of changes have happened in the game in this week. Here you can see a Screenshot from last week. Below a current Screenshot of a different town. This is week number 12 of full time development, I set this week’s Thursday as the Greenlight release. It was really hard to achieve so. I started planning the trailer video on Tuesday, then Wednesday my wife and I brainstormed a few things for the trailer. I knew I wanted a voice on the trailer. First we create a sarcastic dialog between two farmers, a girl(wife) and guy(myself). We made some recordings, we have a lot of fun and then we end up agreeing on having the girl farmer narrating a story. Then we started recording again and despite having our 15 month old kid upstairs screaming randomly, I managed to record the entire dialog. My plan was to start working on the trailer and have it half done or completely done by Wednesday night but I started asking for feedback on GameDev Show and Test and they gave me a lot of valuable feedback. I end up changing a lot of things over the night and didn’t even start the Premiere Project. Thursday morning was more of the same. 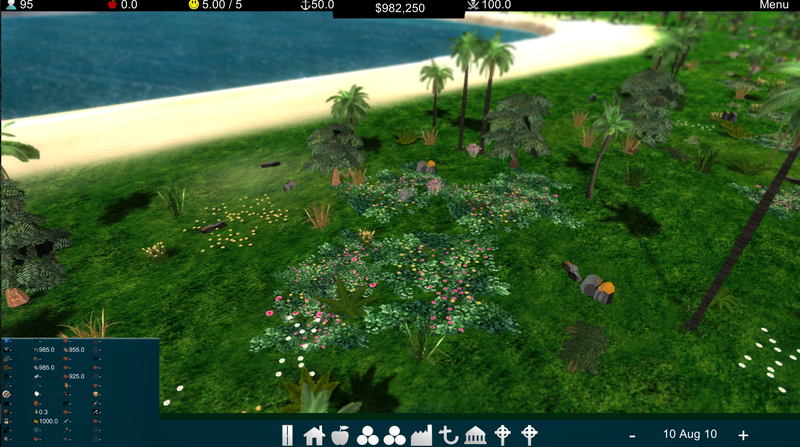 I mainly added SSAO to the game scene, changed lights, shadows, colors and the game GUI. This is the good thing about deadlines, you will get everything done because you are running out of time. I started working on the trailer around 10am and after so much work, at 9:50pm I finished the trailer video. Was happy then. Still had to complete another video that would show off more gameplay. Had to take screenshots, changed a bit of the game description and add the new game logo. Ended up publishing onGreenlight at 11pm or so. Want to express my thanks one more time to the GameDev Show and Test that was really helpful and helped me to focus and change the main things on my game. It was hard to keep the deadline and make things neat but I didn’t stop working. At the end I barely hard any feeling on my right hand. However, felt really good, I finished at 11pm without taking a shower but felt accomplished. At the same time I implemented a material randomizer for the houses, so each one will be different as I described in my previous post and a decoration randomizer too. 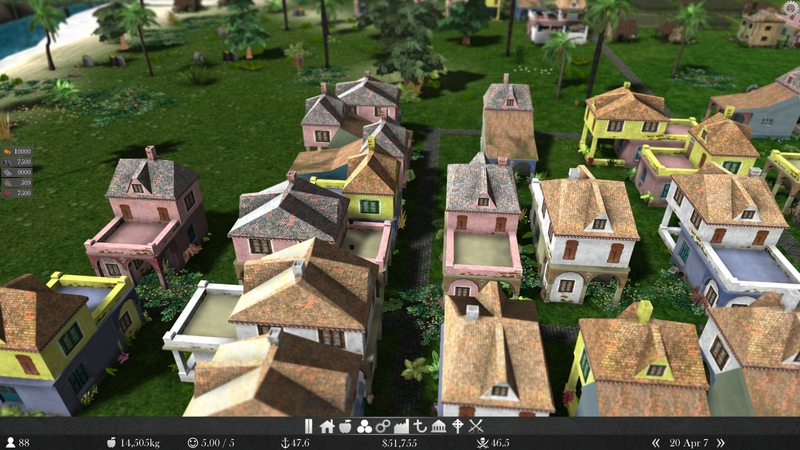 The decoration randomizer will add plants and decorations objects at random to each different building. So each building will have a unique look. There are 40 different objects that can be spawned by the randomizer. Concluding I would like to say that as you are planning your game Greenlight campaign make sure the game is polished and always ask for feedback of people and other developers. Also, plan things out and make sure you give yourself enough time to complete a task, but set definite deadlines. 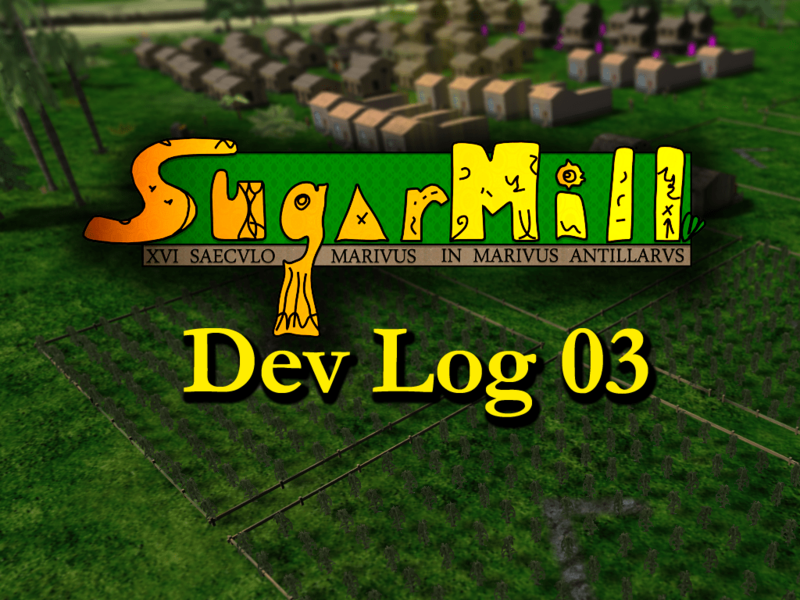 Sugarmill – City builder – Dev Log 3: Mar 10th: Steam Greenlight! My last dev log was post Jan 8. So it’s been a month or so. I would like to start by saying I’m finishing week 8 now. With 12 more weeks to go and the schedule has suffered a few changes. Like always added more programming time, despite the protest of my wife. She insists I spend more time doing art/graphics. It’s hard to balance where I want to spend my time as in order to achieve the best result for my game!Initially I only had 6 weeks for programming only and I extended to 8 weeks. The most challenging thing I have encountered in the last month for sure has been the performance in the game. Can’t seem to get it over 300 people without suffering the FPS. I’m trying to generate the least amount of garbage as possible and been working on that a lot. Thanks to the creator of Manor Lord he has answered many of my questions in regards with Unity Skinned Meshes that are a challenge on their own. In this kind of game you will have many of them at the same time on screen. Rerouting if new buildings are added or removed. Having kids, eating, being happy or depressed. Anyways, they do have a lot going on. The Person class has over 600 LOC and contains many classes itself. The Body and Brain classes are contained in Person. Brain alone has over 1000 LOC it’s by far the most complex piece of code I have ever written. In Unity you only have one threat to deal with which is the void Update() so you cannot do to many things on it otherwise will kill you FPS. For example if you run on every frame a for loop with 1000 elements in 100 objects that will destroy your FPS therefore you have to start to do things more asynchronous. I start a loop and I expect it finishes a few seconds later. So I have to catch it on time and in the proper way. It’s being a rocky journey this with asynchronous calls. The Greenlight concept page has been active, it was in the first 6 positions for the first week. So I’m really happy and please about that. Port Reputation: I worked on this for over 4 hours. Basically if you have business in your port more ships will come to it. You have 4 different structures that will affect that, Lighthouse, Dock, DryDock, Supplier. The Lighthouse gives reputation to your port by shining the light to ships as they go by, should a ship be depleted of resources they will change course and go to your port to replenish supplies. In order for your light house to work effectively, it must have wood and coal to burn and at least one worker. In the Dock you can add both Import and Export orders. If a ships comes and is able to do both imports and export orders it will add points, if the ship is only able to take one (either import or export ) it will not add anything, if its not able to take neither then it will remove port reputation. The structures DryDock and Supplier affect the port reputation in the same manner. If there are items to sell it will increase the port reputation, otherwise it decreses it. Pirates Threat: If goes above 90 you lose the game. To keep it down you have 4 military buildings that must have soldiers to be effective. The buildings are: GuardPost, Tower, Fort, Morro. Once you build a Morro you will keep pirates out of your mind, however building a Morro is not an easy task. 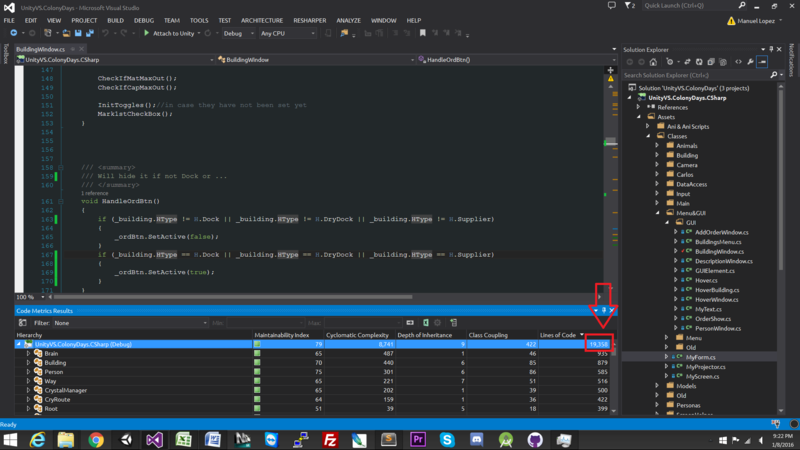 The Visual Studio Project is still growing so far 21397 LOC. The project weight in the hard disk is 1.8GB and the Standalone windows built 32 bit of the game with only couple of maps is 560MB I have not worried much about disk space since PC and Consoles this days have plenty of it. Instead I have focused on the game performance and functionalities of it. Here are wireframe of how a person model has suffered to until it came down to 120 polygons 100 vertexes and only 24 bones, at expense of visual quality has come but I always want it the game to fill as smooth as possible. Must say the Unity Profiler at times is really slow and frustrating but overall it’s really good showing where the pikes on CPU usage or Garbage Collection generation is. Want to say thanks to the Unity team on that one. Definitely want to mention that there were two articles that were recently written about the game. Pirates Ahoy did an amazing article on the game and Simcitycoon as well. Considering all the above, please if you like the game and you support it please (mark it in your calendar) and help spread the word. SugarMill is coming to Greenlight Mar 10th 2016 so during your busy day you can remember to find a spot in and vote the game on Greenlight. Thanks for reading indie mates. Have an awesome weekend and for those who believe in it, Happy Valentine day too! Cheers!